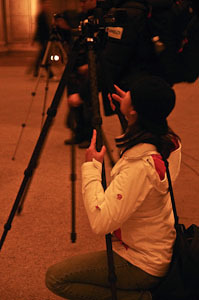 Night started off with a great orientation, where Jean and I got to know the students a bit and what kind of gear they had, anything they really wanted to work on, other than the obvious night photography. Most students had arrived early and were able to take advantage of a REALLY tremendous sunset over Baker Beach. 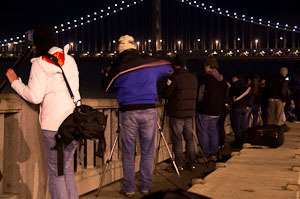 Our first stop was a little perch above the Golden Gate Bridge. Those with large zooms were able to really work on getting some nice tight crops of the traffic moving (slowly) over the bridge. 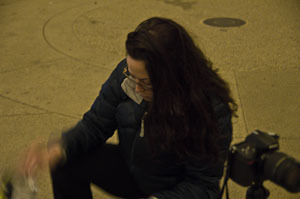 Jean and I worked with the students to start to get a feel for camera settings using longer exposures, and how white balance affects night photography. 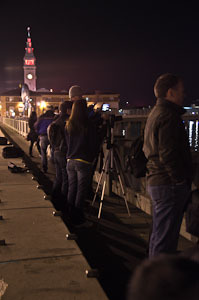 For those who didn't have a remote or cable release, it was a time to learn how higher ISO changes the sensitivity of the sensor, and how to adapt to night photography when you don't have a remote, or forget it at home. The next stop was the great Palace of Fine Arts. The class grew by two here as we picked up two more of our students who had gotten stuck in traffic. We stopped first along the reflection pool in front of the Palace, and even though I've seen it a million times, I'm always awe-struck by how beautiful the Palace is, reflecting in the water. We talked here a lot about tricky lighting and how sometimes two exposures can be ideal for places with extreme light and dark, like this stop. A group of swans swam over to see what we were up to...they probably just needed to know more about white balance settings...or thought we had crackers. "LOWER THOSE WHITE BALANCE SETTINGS, SWANS!! 2800 KELVIN!! Sorry, we don't have any snacks for you." There were also raccoons that came to spy on us. 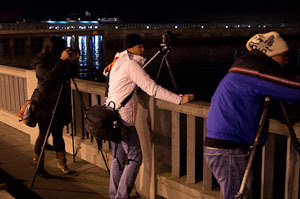 Felt like we were the Dr. Doolittle of photography workshops for a second. After the outside, we moved into the dome area of the Palace, which was great. Two great horned owls were sitting up in the pillars, very cool to see. I've been to the Palace well over 100 times, and never seen owls there before. While I don't think anyone was able to really get any close up shots of them, it was really neat to listen to their hoots echo throughout the architecture. Lombard Street was awesome. Jean and I broke up the group into two smaller ones to keep instruction easier, as well as provide a couple of different composition options. I showed my group how to use a dark cloth to help hold back light in an exposure after the first car had driven by to avoid muddying up the nice headlight streaks. It always cracks me up how many of the cars we're trying to photograph that stop and ask us, 'What are you doing?' thus ruining the shot we were trying to take. 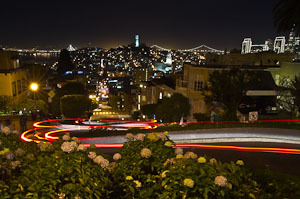 Despite the fact most cars aren't in on our photographic intentions, everyone still learned the concept and got some really great shots of headlights and taillights streaking down the twists and turns of Lombard Street. We took a small break in Little Italy after Lombard Street to grab a warm drink, or snack. Funny how exhausted you can get going out and taking photographs. There was a moment while I waited for the group to grab food where I really realized how PERFECT the weather was, not too cold, no wind, for December it felt more like spring. 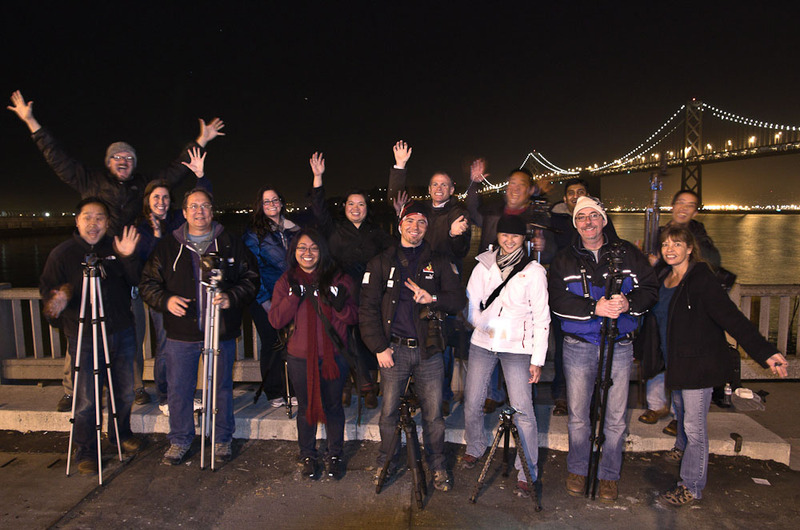 The final stop of the night is the Embarcadero and the great and iconic view of the Bay Bridge. This shot is so fun to take, and as an instructor I think it's the perfect culmination of all the little things we preach throughout the night coming into play; long exposure, lower white balance, composition, etc. 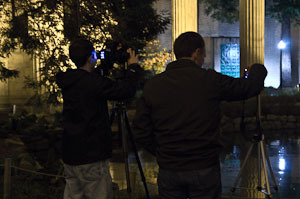 It all falls in line here, and so many people are thrilled when they see their shots come to life on the screen. Even though I think I've seen every compositional option from this location, someone always seems to find a new way to see the bridge that works really well. I saw one really great vertical composition tonight with a perfectly placed group of old pilings in the foreground. Very cool stuff. It was after midnight when we finally finished up and set off back for the cars. 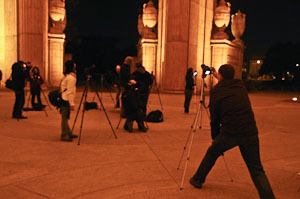 Everyone felt good about their shots, and learned some new tricks with night photography. It was a great group of students, who were all eager and willing to learn. Jean and I really had a great night out in San Francisco. On behalf of myself (Brian), Jean, and everyone at the Aperture Academy, thank you for a another great workshop!